I have been wanting to make this cake for a while now. It has been staring at me from the pages of my Ripe cookbook. I finally caved and decided to make it. I had a peanut butter and jam sandwich shoved in my face the other day and I remembered how much I love this combination. It was one particularly hangry night when my brother, Jack, sensed the first signs of danger (they were pretty blatant) and in the fear for his and his girlfriend's safety, shoved a peanut butter and three berry jam sandwich in my face whilst I was driving home. Within three bites I was close to my normal and semi pleasant self again. Slash not really, but at least everyone would get out of the car at our destination in one piece. So I feel like this is an ode to the saviour of my Thursday night. 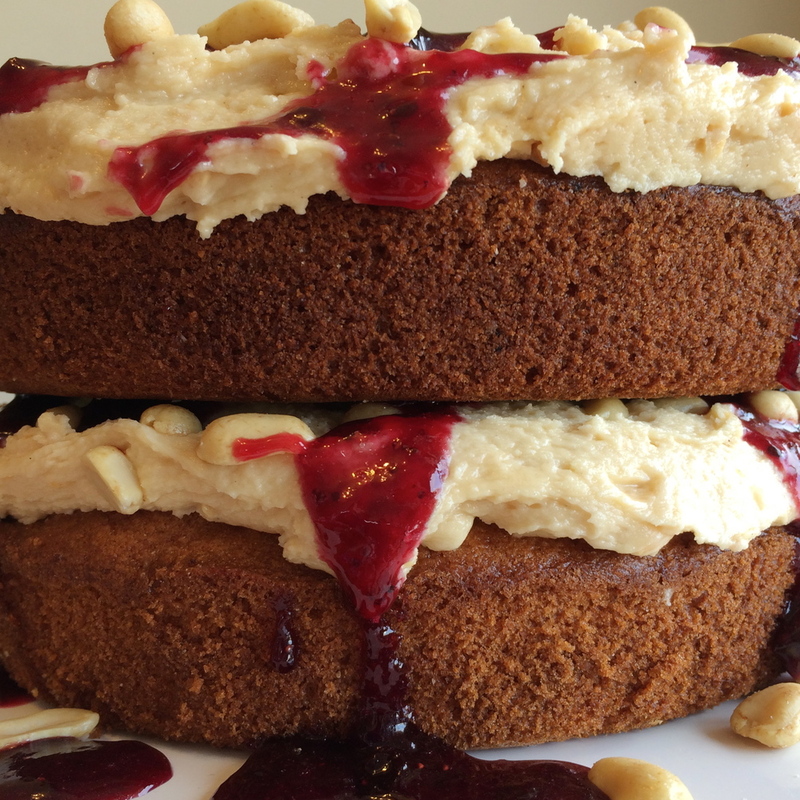 This is really two very butter cake layers sandwiched together with peanut butter cream cheese icing and huge dollops of jam. I am not too sure whether or not to say there is icing on this cake or that there is cake under the icing. There is a tonne of icing and three fat sources in said icing. There is also lots of joy, rainbows and unicorns in it. This definitely isn't the prettiest cake I have ever made. It is a bit sloppy looking with all the jam spilling out the sides. Then again, when was the last time you had a picture perfect PB&J sandwich? Lets claim this cake as "authentic" looking. This cake doesn't keep very well. It is a really buttery cake with half a dozen eggs in it (literally six). Egg whites when baked form a set gel matrix. This matrix however tends to expel water over the course of time. So a cake with a large quantity of egg white (ie this one) tends to go stale quite quickly. I recommend eating this the day you make it or substituting in a plain vanilla cake and just using the same icing if you want to make it a day in advance. In all honesty I am really struggling to write this post. I got up and used all my productivity before 11am after which I went to go rescue a very hungover best friend with BK fries. Six hours later, three trips to BK, a pot of noodles, a trip to Hells Pizza and endless episodes of The Mindy Project I roll out of her room feeling just as revolting and hungover as her but without the fun involved in spending my previous night raging it up. The idea that I have to get up and put my freshly washed sheets on my bed makes me want to weep. I have to go to the bathroom. And have a shower. Ugggh so much effort!! Ok come on Sophie, get yourself together! You can do this . . . Grease and line two 20cm cake tins and preheat the oven to 180 degrees on bake. Cream together the butter, sugars and vanilla until light and fluffy. Beat in the eggs one at a time. If the mixture starts to split add in a couple of tablespoons of the flour to help stabilise it before adding the remaining eggs. Sieve in the flour and baking powder and mix until combined then mix in the milk. Split the batter between the two tins and bake for 30-40 minutes or until a skewer comes out clean. Be careful not to over bake. You may need to cover the cakes with tin foil halfway through the baking to prevent over-browning. Remove from the oven and leave to cool for half an hour before turning out onto a cooling rack. Once the cakes are fully cooled, level off any domed tops with a serrated bread knife. Cream together the butter, cream cheese, peanut butter and vanilla until light and fluffy then add in the icing sugar. Keep beating until the icing is light and voluminous adding the milk to loosen it up as needed. Beat in the salt to taste. To assemble the cakes first take the base and spread over half of the icing. 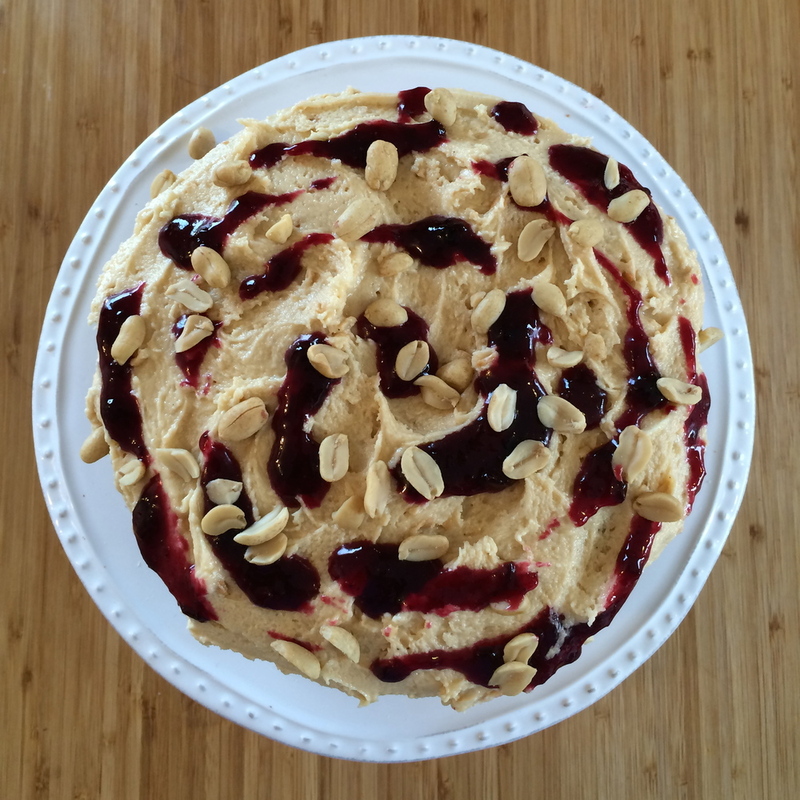 Drizzle over some of the jam and scatter over half the peanuts. Now with the top layer, spread over the remaining icing before you place it on top of the base cake. This will prevent making a mess of the base icing. Sandwich the top layer on top of the base then drizzle over more of the jam. Scatter with more peanuts and you are good to go. Serve with a nice big glass of milk and you could almost claim this as a breakfast food!